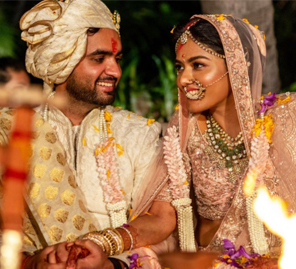 With nine functions, including a cricket match between the bride and groom's families, the Goa wedding of Monika and Sagar raised the bar with its innovative themes and couple entries. Monika and Sagar were introduced to each other by their parents and bonded over text conversations and dates before falling in love. They joined forces with WeddingSutra Favorite - BigBash Entertainment to plan a gala wedding. The dramatic and fantastic moments of the nuptials, such as the one where the couple make an entry in a helicopter, will be etched in their guests' memories for a long time. Here bride Monika shares highlights of her gorgeous Goa wedding. "Sagar and I met in an arranged marriage setup. When I returned to Mumbai after completing my MBA in the US, my parents began looking for a groom. I first met Sagar at The Westin Mumbai Garden City, and our families accompanied us. Sagar and I spoke for four hours straight, and I asked him roughly a million questions! I wanted to know everything about him and his life, and he responded patiently to all my queries. Before leaving both of us exchanged numbers and kept in touch. Our long text conversations and dates had me falling hard for him. We discussed our feelings with each other, and soon enough, we were ready to take the plunge." "Sagar was very keen on getting married at The Lalit Golf & Spa Resort in Goa, and the location of the property meshed well with my dream of having my wedding mandap constructed facing the beach. Thus, our wedding venue was finalized." "BigBash Entertainment planned our wedding, and I will always be so thankful to the team as they did a fabulous job and were very helpful and flexible. They paid great attention to the smallest of details and executed every function with such a strong focus on getting everything right. Our guests could not stop appreciating the arrangements they had done for all the functions. Mr. Gaurish Lad was responsible for the beautiful decor and floral arrangements. My makeup artist was Bianca D’Souza." "Our first 'Couple Entry' wasn’t a wedding function in the typical sense, but our entry into the hotel was so elaborate that it became an event in itself. Sagar and I boarded a helicopter from Pawan Hans, Mumbai, to The Lalit Golf & Spa Resort, Goa and were welcomed by our guests who were cheering in excitement. BigBash Entertainment helped us to release 2000 customized helium balloons when we landed. Girls dressed in white dresses played 'A Thousand Years' by Christina Perri on violins as we walked out. We felt like we were lead characters in a movie!" 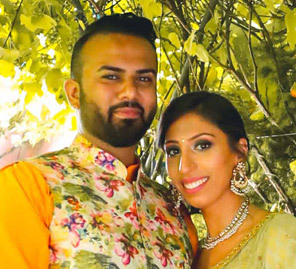 "Since our families are huge cricket fans who regularly participate in inter-community matches, we both knew we had to have a 'Kotharis vs. Parmars Cricket Match' as a pre-wedding event. The decor for this fun activity was inspired by the Indian Premiere League, and we had professional cheerleaders, an umpire, Hindi commentators, banners that read 'Six' and 'Four,' a screen to display scores and of course, trophies for important categories." "The decor for the Casino Night fused retro elements with those of a masquerade party to create a theme that we called 'Bombay Velvet.' We had casino tables where our guests could try their luck. We also had anchor Pankhuri Awasthi, entertainer Mark Parikh, and singer Pallavi at the event to ensure that everyone was having a good time. While retro Bollywood tunes filled the air, other activities and the photo booth made for great diversions for our loved ones." "What’s a wedding in Goa without a party at the beach! This was a must-do function, and we decided to take a quick trip down the memory lane by including an inflatable Takeshi’s Castle in the setup. The decor made use of a lot of blue and white elements with hints of red. The event had several activities, games, water sports, and carnival food. Sagar and I entered the venue on a speedboat for this function." "The setup for this function was very traditional with a lot of marigolds used in the decorations. Even the roofless auto that Sagar and I made an entry into this event was covered in these blooms. Rajnigandha Shekhawat known for her traditional fusion singing gave an engaging performance and added to the cheer of the celebrations." "Our sangeet was a very glamorous affair, and the setup looked nothing less than that of a Bollywood Awards ceremony. When Sagar and I entered the venue, our loved ones created a pathway for us with pyros shooting up in the air. The anchors for the night were Prashant Rao and Pankhuri Awasthy and the night saw some memorable performances, including a segment by singer Rahul Vaidya." 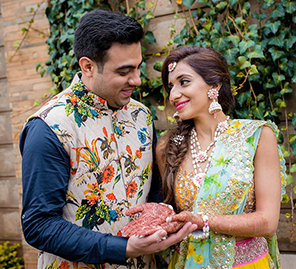 "On the wedding day, we had a 'Phoolon ki Holi' (holi played with flowers) event followed by a very traditional Sajjangoth lunch which is a part of the Marwari tradition." "Red and golden were the colors used throughout our wedding decor. A colossal mandap stood brilliantly against the views of the vast sea. The ceremony took place at sunset and as the skies turned orange and when the sun hit the horizon, the beauty of the setup shone brightest. While we did our pheras, Hiral Kamani’s melodious voice filled the air as she sung traditional wedding songs. Sagar and I had separate entries planned for this function. He arrived with his boisterous baraat and two vintage cars, and I entered accompanied by dancers dressed as fairies." "The decor for our reception incorporated pastel hues, and Sagar and I once again made remarkable entries to the event. At the venue, we had a large stage smothered in pink and white flowers. Florals arrangements were also suspended from the roof, and plush seating was set up on the stage. The vibe for the reception was very western, so I chose to wear a gown and Sagar opted for a black tuxedo."